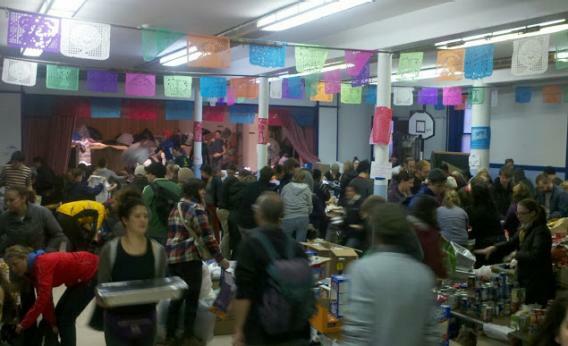 Volunteers inside St. Jacobis Church working with Occupy Sandy's relief efforts. In Sunset Park, a predominantly Mexican and Chinese neighborhood in South Brooklyn, St. Jacobi’s Church was one of the go-to hubs for people who wanted to donate food, clothing, and warm blankets or volunteer help other New Yorkers who were still suffering in the aftermath of Hurricane Sandy. On Saturday, Ethan Murphy, one of the people heading the kitchen operation, estimated they would prepare and send out 10,000 meals to people in need. Thousands and thousands of pounds of clothes were being sorted, labeled, and distributed, and valuable supplies like heaters and generators were being loaded up in cars to be taken out to the Rockaways, Staten Island and other places in need. However, this well-oiled operation wasn’t organized by the Red Cross, New York Cares, or some other well-established volunteer group. This massive effort was the handiwork of none other than Occupy Wall Street—the effort is known as Occupy Sandy. The scene at St. Jacobis on Saturday was friendly, orderly chaos. Unlike other shelters that had stopped collecting donations or were looking for volunteers with special skills such as medical training, Occupy Sandy was ready to take anyone willing to help. A wide range of people pitched in, including a few small children making peanut butter sandwiches, but most volunteers were in their 20s and 30s. A large basement rec room had become a hive of vegetable chopping and clothes bagging. They held orientations throughout the day for new volunteers. One of the orientation leaders, Ian Horst, who has been involved with a local group called Occupy Sunset Park for the past year, says he was “totally blown away by the response” and the sheer numbers of people who showed up and wanted to help. He estimated that he’d given an orientation to 200 people in the previous hour. By midday, a line stretched all the way down the block of people who’d already attended orientation and were waiting for rides to be dispatched to volunteer. Kiley Edgley and Eric Schneider had been waiting about 20 minutes and were toward the front of the line. Like several people I spoke to, the fact that this effort was being organized by the occupy movement wasn’t a motivating factor—they found out about the opportunity to volunteer online and just wanted to help. So how did an offshoot of Occupy Wall Street, best known as a leaderless movement that brought international attention to issues of economic injustice through the occupation of Zucotti Park in the financial district last year, become a leader in local hurricane relief efforts? Ethan Murphy, who was helping organize the food at St. Jacobis and had been cooking for the occupy movement over the past year, explained there wasn’t any kind of official decision or declaration that occupiers would now try to help with the hurricane aftermath. “This is what we do already, “ he explained: Build community, help neighbors, and create a world without the help of finance. Horst said, “We know capitalism is broken, so we have already been focused on organizing to take care of our own [community] needs.” He sees Occupy Sandy as political ideas executed on a practical level. As frustration grows around the city about the pace and effectiveness of the response from FEMA, and other government agencies and the Red Cross, I imagine both concerned New Yorkers and storm victims alike will remember who was out on the front lines.